The Department of Water Resources (DWR) needed to construct a new bridge across Horesethief Creek in San Bernardino County in order to provide reliable access to the California Aqueduct. 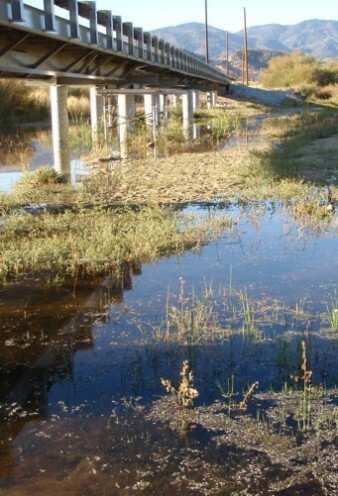 The project required removal of an existing 300-foot earth and culvert creek crossing and construction of a raised railroad flatcar bridge over Horsethief Creek, a tributary to the Mojave River. The project presented specific technical challenges because the area is subject to heavy winter storm flows that limit the construction window, and because the creek and adjacent uplands are occupied by arroyo toad, a federally listed species. Aspen worked closely with regulatory agencies to develop a strategy for completing bridge construction while avoiding the peak season for arroyo toads and other sensitive wildlife present at the bridge site. In support of DWR Aspen completed all required CEQA documentation, prepared and processed federal and State environmental permitting, and conducted biological surveys for rare plants, listed amphibians and migratory birds. Specifically, Aspen conducted extensive surveys for rare plants and sensitive wildlife including protocol surveys for arroyo toad, southwestern willow flycatcher, and least Bell’s vireo. Aspen conducted a wetland delineation of the site; documented native trees; and prepared/submitted applications to obtain a Clean Water Act Section 401 Water Quality Certification, Section 404, and a Section 1602 Streambed Alteration Agreement. On behalf of the Federal Energy Regulatory Commission, Aspen acted as the non-federal lead representative in coordinating formal Federal Endangered Species Act Section 7 consultation for arroyo toad. Aspen prepared the BA and worked directly with the USFWS to secure a Biological Opinion and to effectively implement wildlife management, mitigation, and monitoring activities during construction of the bridge. Aspen coordinated with other regulatory agencies, including the USACE, CDFW (formerly CDFG), and Lahontan RWQCB to secure the necessary permits required for projects within jurisdictional waters of the US and State. Prior to construction Aspen conducted pre-construction clearance surveys, implemented worker training, and provided biologist to monitor water quality and limit disturbance to listed species.